Over the past two decades, numerous reports indicate that national rates of arts attendance have been declining. This downward trend is reflected in both survey data and in the day-to-day experiences of many nonprofit arts organizations. In California, attendance rates -- as defined by traditional measures -- have also declined. And yet, there is a sense that the arts and culture are flourishing as never before, with a renewed vigor and excitement. How do we understand this apparent contradiction? The trend in attendance figures, however, does not reflect Californians' participation in a wide array of arts and cultural activities. People's participation in arts and cultural activities, especially in ways that allow them to develop or release their own artistic impulse, is extensive -- and perhaps nowhere more so than in California. At the same time, California's cultural landscape is undergoing massive changes, affecting the ways people encounter, experience and engage with art. These changes include California's demographic shift to being a so-called "majority-minority" state and rapid technological advances that offer new opportunities for artistic expression and access. These changes pose challenges and exciting new opportunities for how artists and organizations create and share their expertise and work. But to understand these changes and their implications for the nonprofit arts field, a broader, more nuanced, more complete understanding of how Californians participate in arts and culture is required. 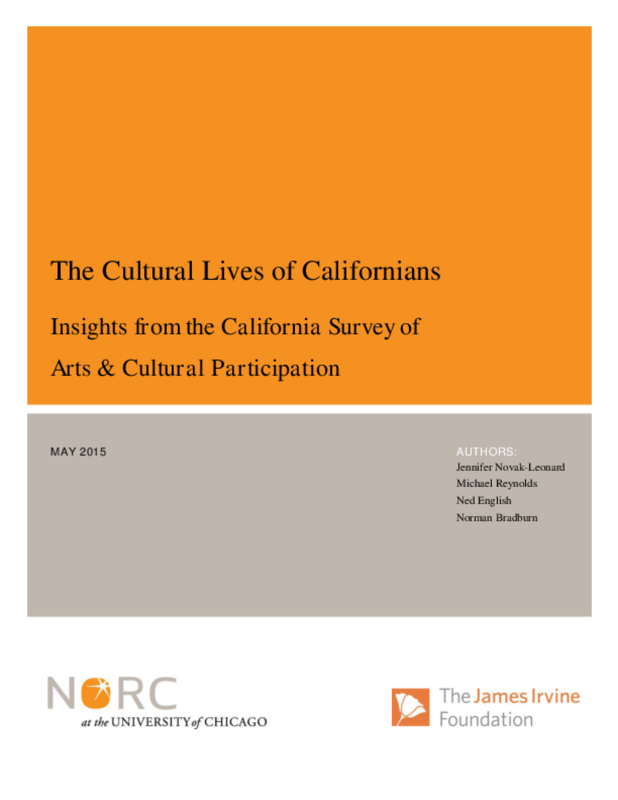 The California Survey of Arts & Cultural Participation is a tool we developed to ask a wide range of questions about what Californians do to engage with arts and culture. Copyright 2015 National Opinion Research Center (NORC) @ University of Chicago, The James Irvine Foundation.